Tepees are the tents used as living space by the native americans indians. Jean loup Sandro, a craftsman who live in south of France, create, sell, and rent tepees all over France. 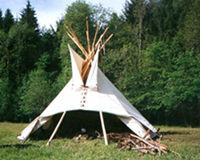 Tepees are natural, ecological and this traditionnal way of life is part and parcel of environnement.